With warming summer temperatures across Alaska, white spruce tree growth in Interior Alaska has declined to record low levels, while the same species in Western Alaska is growing better than ever measured before. The findings are the result of a study led by University of Alaska Fairbanks School of Natural Resources and Extension researcher Glenn Juday, Claire Alix of the University of Paris 1 Pantheon-Sorbonne, and Tom Grant, formerly an adjunct faculty member at UAF. Their findings were recently published online by the journal Forest Ecology and Management. The paper is the result of 10 years of research. Juday and Alix gathered white spruce tree cores and disks from 540 trees in 36 stands along the Yukon, Tanana and Kuskokwim rivers. 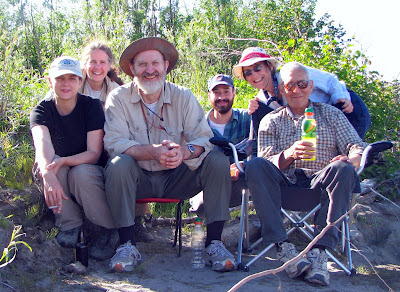 They started in easternmost Alaska and sampled downriver to the western edge of the boreal forest near the Bering Sea. The research required the team to travel hundreds of miles down some of the most pristine large rivers left on Earth. Sam Demientieff, a longtime Interior river traveler and Alaska Native leader, provided much of the river transportation and expertise required to navigate the silt-filled water and constantly shifting channels. The researchers took two measurements from each annual growth ring of the 100- to 250-year-old trees, then analyzed the nearly quarter-million measurements to determine how much the trees grew each year. They then compared that growth to temperature data from eastern, Interior and Western Alaska historical records and weather stations. In addition, they drew on previous scientists’ work chronicling tree growth and temperature back more than two centuries. 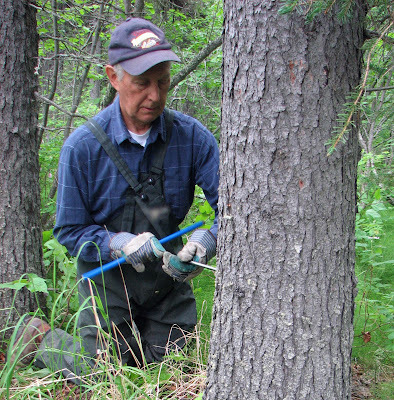 They found that in Interior Alaska, as summer temperatures rose, the growth of the trees slowed. Meanwhile, in Western Alaska, which is also warming, the trees are growing more rapidly. White spruce trees thrive within an optimal temperature range. The long-term average temperature in Interior Alaska used to be at the high end of that optimum. In Western Alaska, the average temperature was below or at the low end of the optimal temperature range. In the mid-1970s, temperatures suddenly increased and have cycled around a higher average since. Interior Alaska’s average temperature became warmer than the trees’ ideal range, and growth slowed. Meanwhile, the average temperature in Western Alaska increased to more closely match optimal conditions, which increased growth. This article was written by Marmian Grimes of UAF Marketing and Communications.